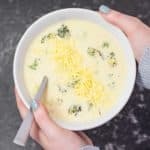 Keto Broccoli Cheddar Soup Recipe - "Cheesy, Warm & Delicious" - Very Easy! This Keto Broccoli Cheddar Soup is a bowl of total goodness, loaded with essential fiber, electrolytes and nutrients for a healthy diet! Not only that it "Tastes Great and is Easy to Make". Place the broccoli into a lined roasting tray. Sprinkle over 1 teaspoon of the oil. Roast in the oven for 12-18 minutes, remove and stir halfway through. Cook until browned. Add the heavy cream and stock and bring to a simmer. Add the cheese and sprinkle over the xanthan gum. Continue to simmer for 3 minutes before removing from the heat. Blend the soup using a stick blender. Stir through the roasted broccoli. Taste and add more salt if desired.